Return to smile thanks to conservative therapies! From simple or complex fillings to devitalization and root canal treatment. The branch of dentistry that deals with the care of the internal tissues of the tooth or the pulp is called endodontics. It is commonly associated with the devitalization of the teeth, or the root canal treatment, in which the damaged dental nerves are extracted due to traumas, ruptures or caries. Endodontics is a conservative dental cure that allows the tooth structure to be restored without dental extraction. Contact the Dentiamo dental clinics located in province of Venice and Padua if you need to devitalize a molar or need a complex filling for caries. Our dental center takes 360° care of your smile thanks to dentists who are specialized in conservative and endodontic procedures. Your dentist will be responsible for diagnosing inflammation, prescribing antibiotics, as well as to administer specific treatments to eliminate the bacterial load and infection in the dental canals and the tooth pulp and then perform the devitalization, root canal treatment or apicectomy in the case of granulomas. Dentiamo dental professionals will take care of you endodontic treatment by means of 3 or 4 different channels, including the extraction of the dental nerves through various different instruments, as a result of which they are then able to free the dental channels, medicate the tooth, and fill it with biocompatible radiopaque fibers. The patient can get his smile back and be able to chew normally within a short period of time. Fill in the fields in the form or contact us by phone. We are delighted to welcome you to our clinic and evaluate your needs. Following devitalization, the dentist specialized in conservation will proceed to simple or complex fillings for the reconstruction or restoration of the tooth. Today aesthetic fillings in light amalgam are performed that are able to fully integrate with the color of the original tooth and harmonize the smile. 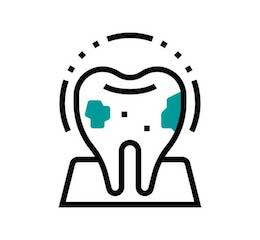 In case of deep caries, and weakening of the teeth due to the devitalization, the dentist can then decide whether to apply a dental crown, in other words a prosthetic material for covering the tooth, strengthening it and making it stronger and completely identical to the original tooth. As of today you can take advantage of a truly special price in Italy. The cost to you for devitalization, root canal treatment or conservative reconstruction of your tooth is discounted by 55% if you select Dentiamo as your dentist! Thanks to our discounted rates, the highest quality and professionalism are now available to you at a price that is accessible to all! Save on devitalization and fillings! Trust the safety of our certified Italian dentists! Visit the our dentists at Studio Dentistico Dentiamo today and take advantage of our Conventions and discounted rates for devitalization, fillings, and ceramic dental capsules starting from only 279 euro. Complete the form on this page and get your smile back. Our staff of specialists are at your service. DO YOU NEED TO CARE A CARIES OR DEVITALIZE? Do you have to devitalize a tooth? Contact us with confidence! Trust our active dental center in Venice and Padua.